Petro-Canada America offers the purest Heat transfer fluids in the market for non-pressurized liquid phase, closed systems. For over 25 years, they have produced some of the purest base oils in the world – 99.9% pure. 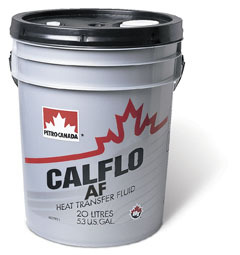 CALFLO AF – Formulated for systems where fluid resistance to oxidative breakdown is critical. Provides high thermal efficiency in systems operating up to 600*F. Applications include plastic extrusion, plastic molding, rubber manufacturing and metal die-casting. aromatic compounds. For operation at bulk temperatures of up to 620*F. Applications include chemical processing, power generation, dye-casting, resin manufacturing and metal plants. CALFLO LT – Synthetic HTF for temperatures ranging from 40*F to 550*F specially designed for outdoor applications with excellent pumpability for start-up conditions as low as -40*F. Applications include exothermic and endothermic reactions in chemical and pharmaceutical plants as well as refinery applications and grease plants. PETRO-THERM Heat Transfer Oil performs in non-pressurized, liquid phase, closed heat transfer systems operating at bulk fluid temperatures up to 599*F. It is specifically formulated to provide long service life and excellent thermal efficiency in a variety of industrial applications while resisting oxidative and thermal degradation. PURITY FG Heat Transfer Fluid – Used in an assortment of food processing applications, this fluid provides great thermal and oxidative stability. PURITY FG is registered NSF HT1 and suitable for non-pressurized, liquid phase, closed heat transfer systems up to 619*F that require a food safe product. It is formulated to provide higher thermal and oxidative stability which can contribute to extended fluid life and lower operating costs by reducing the frequency of fluid change outs and associated down time. PC Cleaning Fluid – PC Cleaning Fluid is specifically designed to effectively clean dirty or heavily carbonized systems which have been operating on aromatic based or mineral based heat transfer fluids. Not for use in food processing facilities. Upper operating limit is 212*F. Should be used along with Petro-Canada Flushing Fluid to thoroughly clean and rinse dirty systems. PC Flushing Fluid – Specifically designed to effectively flush out dirty oil-circulating systems including those operating on heat transfer fluids. Effective in loosening sludge, removing trapped fluids and dissolving breakdown products. PC Flushing Fluid operates effectively as a mechanical flushing agent for heat transfer systems changing to CALFLO from non-compatible materials. Completely compatible with hydrocarbon based fluids and with all grades of CALFLO.